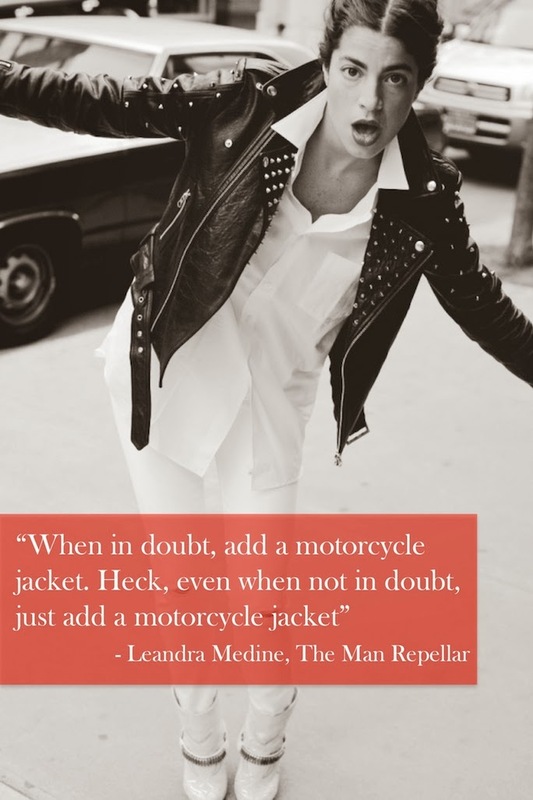 "If people remember nothing else about me when all is said and done, they should remember my other life mantra: when in doubt, add a motorcycle jacket. Heck, even when not in doubt, just add a motorcycle jacket." Leandra Medine, The Man Repeller: Seeking Love. Finding Overalls. Happy Fashion Quote Friday!! According to Glo, this is one of the 8 Best Lines from the Leandra Medine's new book, and I couldn't agree more! Medine's love of motorcycle jackets is not unshared by many of us. I mean heck, any gal that rocks a moto jacket over her wedding gown (see here) is basically my fashion idol. More on moto jackets next week, but for now enjoy some of my favorite links from this week! iVillage shares 10 ways to stage an Ikea Expedit Bookcase. This post is likely to tempt you to battle the newly weds and screaming babies at your local store. Play your own game of "Who Wore It Better" with FabSugar's look at the Doppelgangers on the streets of Fashion Week. Has anyone been trying to cut down on carbs? I made this cauliflower rice for the first time this week and both my fiance and I are new believers!